A University of Mississippi drummer with the Pride of the South Marching Band has proven he’s both musically and mechanically-inclined by starting his own business and landing his first job as a student engineer. Oxford native Joseph Reed, 21, is a senior studying mechanical engineering with a minor in music. Reed developed a love for music in high school as a member of the band’s percussion section for four years. For two of those years, he was percussion leader and in charge of teaching pieces to other drummers. Reed said the strict order of rules within the band taught him honor, integrity and responsibility, and he became a perfectionist. That trait also helped Reed during his senior year of high school, when he took a wood and mechanics class and became interested in manufacturing and engineering. When building anything, Reed said there has to be a base or solid foundation to support the item as a whole. There is also a specific order one must follow to completion. Reed chose mechanical engineering with a minor in music as his foundation, and he became a member of UM’s Pride of The South Marching Band. While playing with the band, Reed also decided to start his own business buying, manufacturing and selling new drums. Although business started slow, he managed to build a large clientele in Oxford for his small company, Reed’s Drum Products. Thaddeus Moss, Reed’s friend and fraternity brother, helped to establish Reed’s Drum Products by finding a company in Memphis that would give them drum parts for a small price. Reed soon became well-known on the Ole Miss campus for his work. Reed has also marched with Nashville’s Music City Drum & Bugle Corps and Ohio’s prestigious Bluecoats Drums and Bugle Corps. 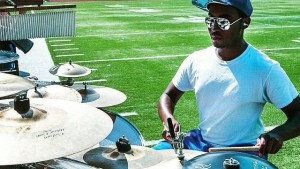 As the front ensemble section leader, he led the Bluecoats to a third place victory this summer out of 24 competing drum corps in the show “Kinetic Noise.” The Bluecoats competed in 34 shows this summer, including three performed in NFL stadiums and two that were broadcast live in hundreds of movie theaters. Reed’s other love is mechanical engineering. He worked hard to maintain a 3.5 GPA and was offered a student job at the BMW manufacturing plant in Greenville, South Carolina. Though he would have to return to college between the plant’s fall, spring and summer rotations, Reed took the job as a co-op student engineer. He works in the new model department of the BMW Paint Shop, where he prepares paint for new BMW models that will be produced at the South Carolina plant for 2016 and 2017. If Reed learns to speak German before he graduates, he will be offered a fourth rotation at BMW’s head plant in Germany.